OK, those who followed my Little Cleveleys Tramway thread, entries from me to which stopped a while back now, tune in here! I ended work on that board as it wasn't doing what I wanted. Being very very busy with far too many other draws on my time, anything attempted had to be smaller. Then I hit on the idea of combining a built but not in any way populated board pair to be sheds so my loco stud could blink in the daylight with a third end board. 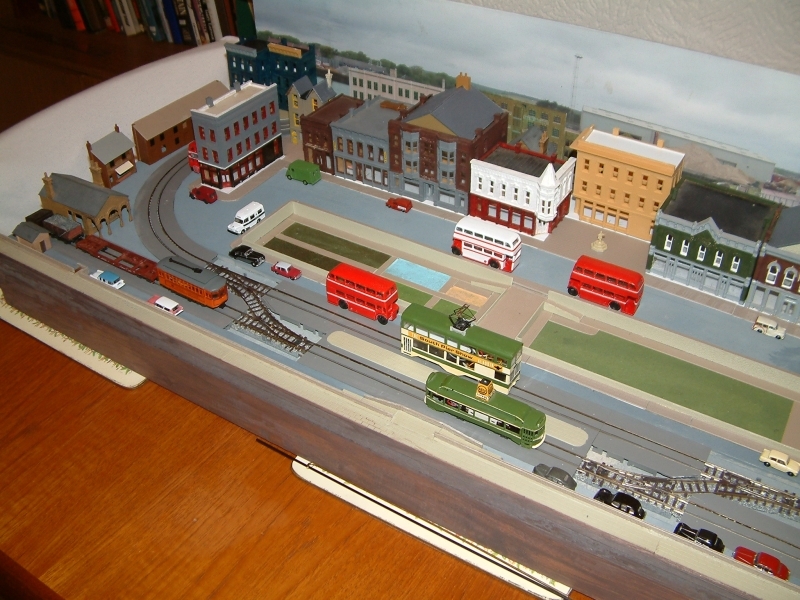 The added value was that this new tramway board would be small enough to fit into a dining room display cabinet AND be operated from there when not connected up with the two main boards. That's the theory, so in future posts I'll relate my experiences and work up to show current state. Don't expect too much as my approach to modelling is scatter gun, and so virtually everything and anything is incomplete, but sort of works!! 1. 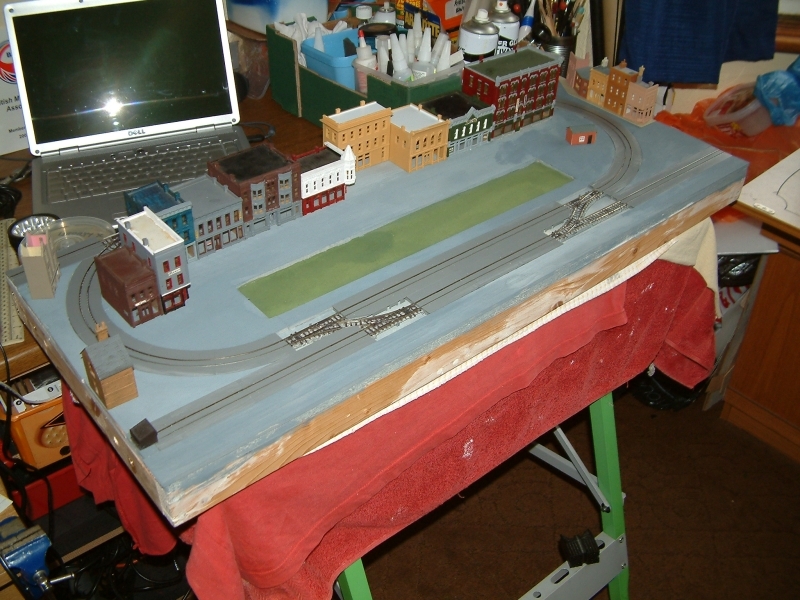 At the rear left which will run to the fiddle yard for the railway. This is disguised when in lone board mode by a building and its pavement. 2. 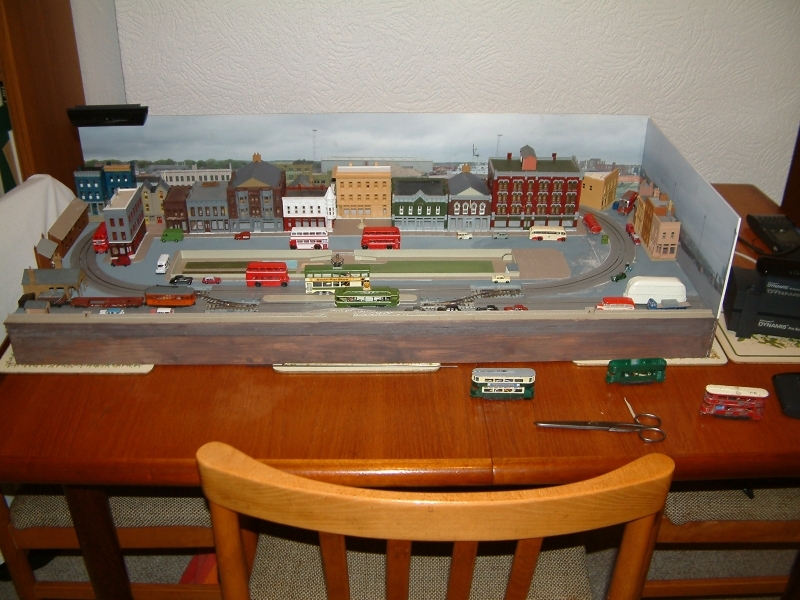 At the front left, which in lone board mode has a buffer end unit fitted. 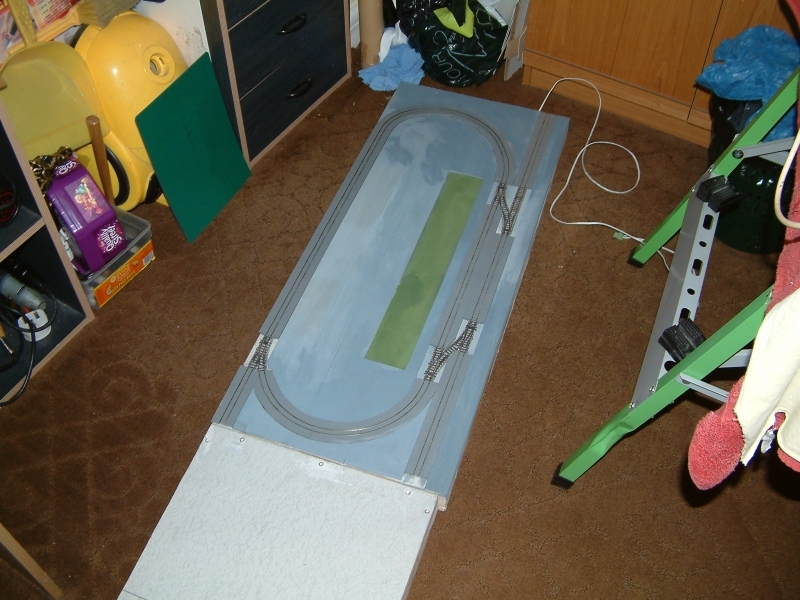 I made a right mess with the test of concept track board routing it out to sink in the track and then plastering the gaps, which also makes it awkward to remove if needed or when maintenance is required to turnouts, so THIS board has balsa sheet planed to the height of the Tomix Wide Tram track, MUCH cleaner and easier to do!! Currently the turnouts are not road surfaced. I won't be using the Tomix "planked" appearance units, but plasticard, and I will be attempting to flush off as far as possible inc the moving blade area. The Tomix track lifts out if required as its not fixed down, but its held well enough by the balsa to allow transportation and handling. Only when full tested will all of it be painted to match, hence why the track stands out as a different shade of grey now. This alone will transform its appearance. Basically while used stand alone the track plan is a simple single track oval with front passing loop and two short "sidings". The low relief buildings at the left end are an Ice Cream Parlour and a terrace of houses. These will also remain removable so when joined up other full depth buildings will be fitted to disguise the joint. The longer front left building with arched canopy is an Information Office and Public Toilets. The central sunken gardens have a small paddling pool and sand pit for the kids when the tide is in. I'm currently trialling something unusual for the green part of the garden, and I'll not be pressed on what, you'll just have to keep tuning in!! 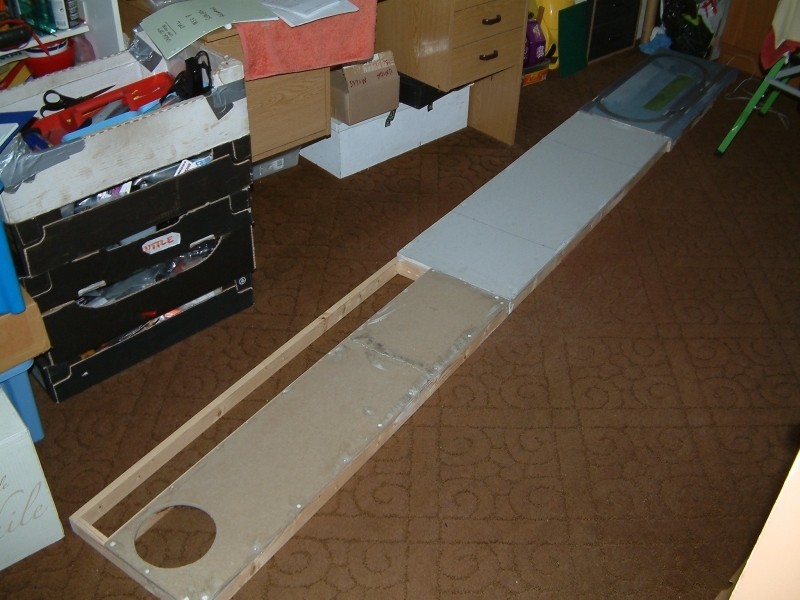 Last weekend I made eight different Crazy Golf holes for the RH half, not shown here, now I need to paint them! 1. Access steps and ramps to a tidal washed "beach". All the buildings are unfinished, some totally unpainted. They have plasticard bases (currently still white) to raise them to pavement level. These will be fitted to each building via small countersunk screws from underneath the "floor" to small blocks glued inside the building walls. Each base floor will be screwed to the walls from the underside. This will allow construction of the needed internal cosmetic detail inc walls and for the lighting partitions so that maintenance is possible, and "rooms" have their own light source. I'm currently looking into light fibres to make the animated Amusement Arcade sign. Got a test rig running. 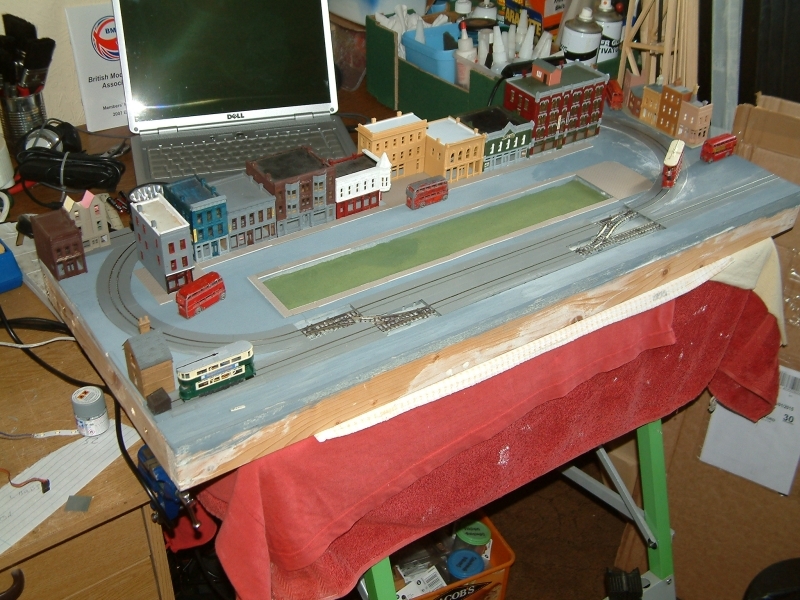 OK enough chat...................................some running with my 4 wheeled "Test Tram"
Now for some pics. Note, the earliest pic is 5/2/15, the last 1/3/15, less than a month. In case anyone is interested (and why would you be! ), a word or two on the Buses in shot. 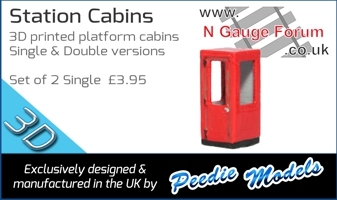 They were all done in the last month, and are as usual for me unfinished, as I have just this week received the decal sheets to print the destination panels and adverts I have made. 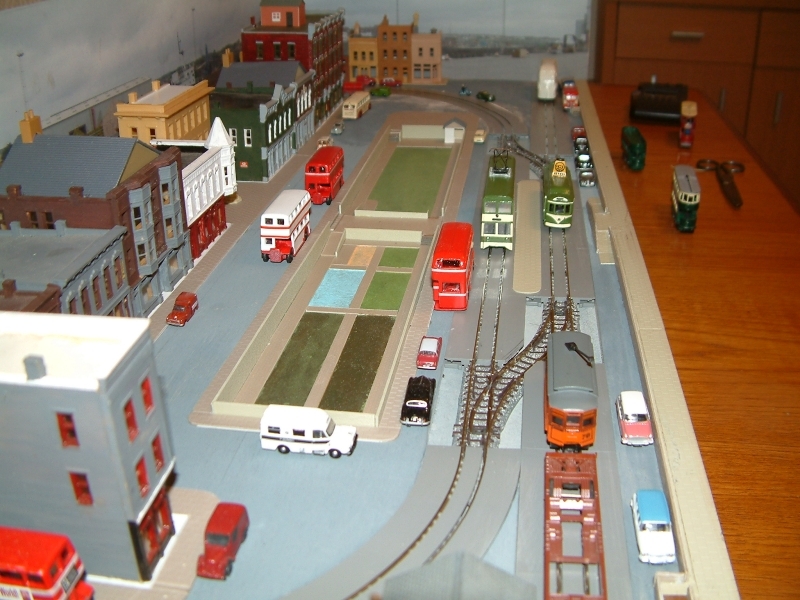 They are Matchbox first and second series models, the as yet unpainted one rear right is the smaller model, the rest the reissued larger one. In case you want to know, the later larger one is four bay, the earlier five, which makes picking from EBay, etc easier!! SO, why is one in "reversed" livery? Well, it wasn't uncommon for companies to reverse livery dual purpose, convertible, and open top buses. The one shown is a convertible shown with its roof on. I have just got another one to hack off the roof. I had one from my childhood when I started, so I must single handedly be helping raise secondhand prices considerably for original unmodified Matchbox No5s!! Did I even spot a balloon? Anyhow good work and carry on! Sorry about the pics but my photo album access has been ceased and the server owner isn't replying to mails as yet. As I'm now well into RC flying season AND in demand bus wise to go to events (I drove all the way Arundel/London/Brighton/Arundel on Sunday in a 1930 one, only slightly tiring) since we have the oldest buses from a company celebrating 100 years this year, the tramway is losing out hours wise. I'll get back to it when I can, maybe even this week if the weather is as dire as forecast!